Dwightmare Returns to Orlando ~ Roundball Manor - The House that Basketball Built. After leaving the team in ruins last season, DUHWight pulled his 'mea culpa' routine with the media before the game, saying how much he loved the city and the fans while smiling at them through his teeth. Everything he says is completely disingenuous and the fans of Orlando KNOW it. He pulled the same antics for the past two seasons and they could do nothing about it. 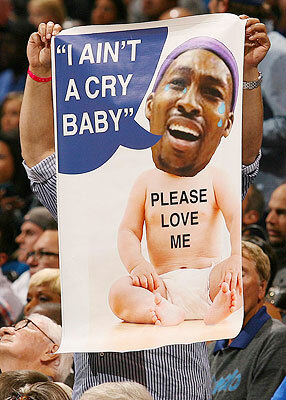 Now a year removed, he is still displaying his immaturity taking jabs and blowing kisses at the fans during the game. With all that being said his return back home turned him into the Superman of old, as he absolutely dominated the game with 39 points and 16 rebounds, controlling the paint on both sides of the ball while shooting 25-39 from the free throw line! 39 ATTEMPTS. This is the Dwight that Laker fans have been waiting for all season long, the Dwight that they are relying on to save their season, the Dwight they are hoping to make a playoff push with. If he can continue to improve and get healthier, the Lakers will be sure to give another team a dogfight come playoff time. 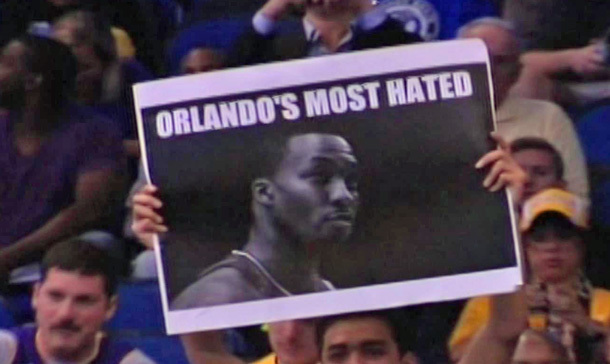 However, down in Orlando there are still plenty of many Magic fans who aren't ready to forgive the man who left their franchise in ruins. Even after eight great seasons, his actions and immaturity left the team and city in total devastation. Only time will tell if Dwight can mature enough to elevate his game and his attitude to the next level, moving beyond the mess he left behind in a place he once called home.